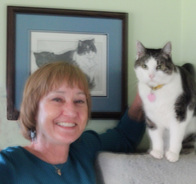 President of Lifeline for Pets, Kathy Hart, with her kitty, Ruby. We need volunteers, age 18 and older, to help in a variety of ways. Our Cat Pad can always use spare hands willing to clean, feed and socialize with the cats. Or you can help with pet adoptions, fundraising, administrative tasks and more. We are happy to work with your schedule. Whether you can help a little or a lot, we need you!